It’s a gloomy, gloomy day. What is really going on with this weather? It’s so depressing. I’d rather enjoy some bitter cold snow than this in between wet mush. The one good thing about this kind of climate — arguably bad, actually — is the perfect opportunity it creates to bake and eat, bake and eat (again), bake and share. Gloomy weather is the perfect reason to stay in and bake! And for me personally, it’s the only time I’m really inspired to work on my baking skills…they’re still quite limited, even after 18 years of cooking. My thing is flan. We all know this. But I love, love the idea of mastering at least 15 desserts, not just Latin or American classics. I just fail miserably at committing time to working on ratios. I have everything a solid baker could want and need, and I do use them a bit, but not as often as I’d love to. Imagine… a kitchen full of stand mixers, measuring tools, a robust baking pantry, more molds and pans than I can conceive, and yet still, I’ve only gotten around to baking 7 desserts this year. And now 8. Thanks to this week’s dull weather. I’m not a pecan pie fan. Never have been. The 7 years I lived in Atlanta didn’t do much to pique my interest. I was, however, amused at how much it’s eaten in the south. It’s the quintessential all American southern pie. But what I’m most amused by is my mother’s recent confession that she loves it! What? I was so confused. So shocked. And so totally unamused that I’m just now learning my ace, my confidant, my best friend, my Mami, has been secretly obsessing over something she’s never baked. And so you guessed it. She’s the inspiration behind my first ever pecan pie. It was a process. I had to get over my distaste for it. I realized the reason why I’ve always shied away from this indulgent pie. It’s quite simple. It’s just too sweet. It’s like begging for all of my teeth to fall out at once, eliminating the possibility of enjoying anything else. Ever. It’ll take you out. And run up your dentistry bill. That’s been my thought process. A killer pie, of sorts. If this was going to be a success… both for my Mother to fully enjoy and be proud and for me to actually taste it, I was going to forcefully modify an original recipe and tone down the sugar. But it didn’t quite work out that way. My friend Amanda is a southern girl trapped in D.C. She invokes every bit of her Alabama roots. That girl bakes as much as my pro baker friends. Truly. It’s impressive. She was my source for this idea I had in mind. I knew she’d have a recipe I could possibly like. Her “granny’s” was it. I begged her to share so I could study it. I stuck to what I knew — more like what her grandmother’s mastered — and modified my palate. I convinced myself I could have an open mind about this thing. Surprisingly, it worked. Two full attempts later and I ended up with a pie I was excited about and took a bite of. And came back the following day for another. But the biggest victory was securing my mother’s approval! While she’s never made one herself, her sacred (or secret) familiarity with it qualifies her to knock it down! And she didn’t’! It’s crazy I still seek my Mom’s approval, but sometimes, Moms are always right. When it comes to the kitchen, mi mama gives me a beat down. She loved the consistency of the mixture and truthfully, that was my favorite part. And, I did bake it a bit longer so that the sugar coma which I would have been a victim of, wasn’t in the realm of possibilities. I wanted to enjoy the pie, not die by it! 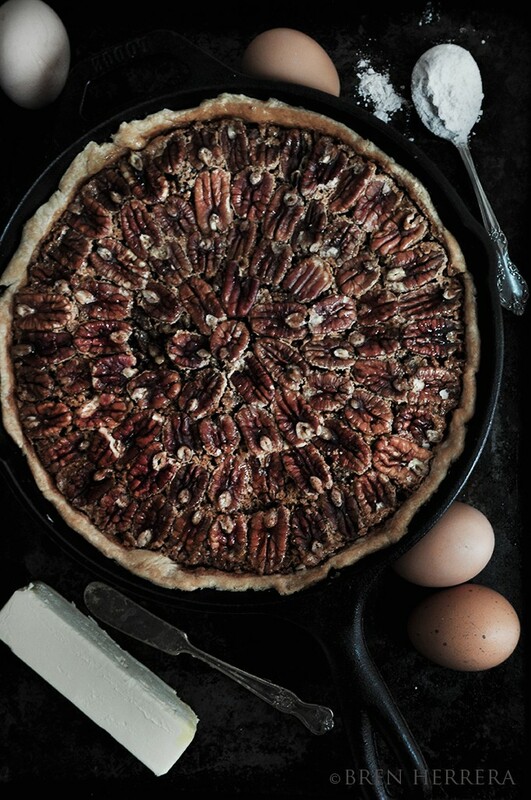 Ultimately, the whole pecans were a bit toastier, giving it a beautiful contrast to the delicate center. For now, I’ll relish and bask in the glory of making a classic southern dessert which has now been requested by my salsa dancing partner. My mom snuck him a piece. That’s a good thing. Because as much as I actually loved my masterpiece, there’s no way I’d bring myself to eating it all alone. Now, flan and apple pies are another story! Open your mind! Enjoy making and eating something different this season! And if you’re not there yet, bake something you love and gift it! There’s joy in sharing! Happy holidays! Stay tuned for more holiday and Christmas noshery. Preheat oven to 325F. Fit pie crust in 10 inch cast iron skillet. Dust crust with powdered sugar. Whisk eggs in large bowl until foamy but not a stiff pique. Whisk in all other ingredients, including chopped pecans. Gently pour into crust and evenly spread out, if need be, using a rubber spatula. 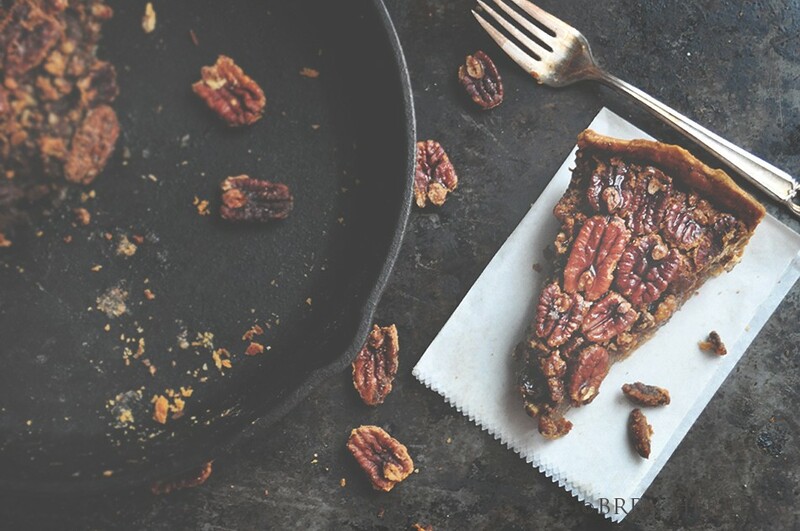 Arrange pecan halves atop pie in a uniform pattern, covering it fully. Bake at 325F for 30 minutes. Reduce temperature to 300F and bake another 30 minutes. Turn oven off and let pie sit in oven for 3 hrs with the door closed. It looks amazing and extremely tempting! 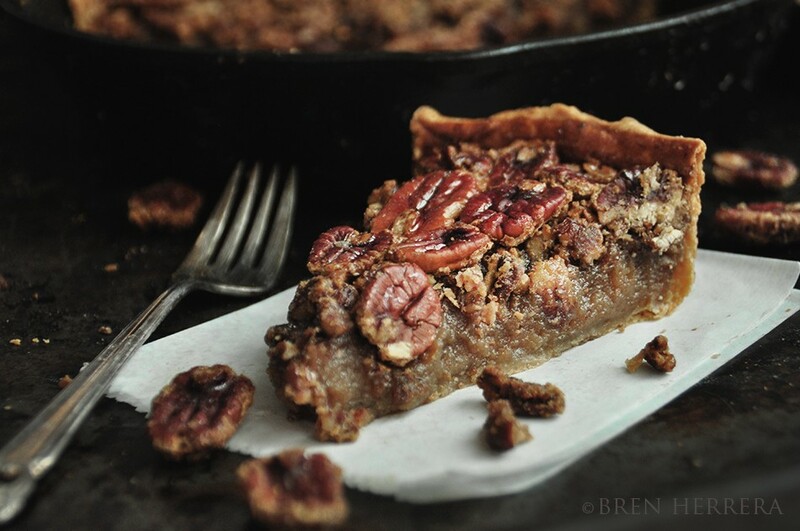 I consider pecan pie the American version of butter tarts, or is a butter tart the Canadian version of pecan pie? Needless to say I love both. I can’t believe i had this sitting in front of me at least 3 times and I didn’t even take a bite out of it.. So bummed cuz that joker looked and smelled amazing.